These shrimp are complete with the head, tail and shell still intact. These shrimp are NOT peeled nor deveined. These shrimp come with the head off and with the shell and tail still intact. This shrimp is NOT peeled or deveined. “Green” does not refer to shell color but to the uncooked, raw state of the shrimp. These shrimp are peeled (no shell) with the head and tail removed. They have been peeled but have NOT been deveined, meaning they still have the vein intact. These shrimp have been peeled (no shell), have the head and tail removed and have been deveined, meaning they no longer have the vein intact. These shrimp have been peeled (no shell) and have the head removed with the tail still intact. They have been deveined, meaning they no longer have the vein intact. Brown shrimp are crustaceans with 10 slender, relatively long walking legs and five pairs of swimming legs located on the front surface of the abdomen. They are grooved on the back surface of the shell and have a well-developed, toothed rostrum (part of their shell) that extends to or beyond the outer edge of the eyes. The tails of brown shrimp usually have a purple to reddish purple band and green or red pigmentation. Nearly 97 percent of the brown shrimp harvested in the United States comes from the Gulf, mainly from Texas and Louisiana. 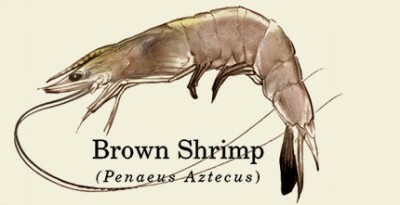 Brown shrimp are available fresh and frozen year-round. White shrimp are crustaceans with 10 slender, relatively long walking legs and five pairs of swimming legs located on the front surface of the abdomen. Unlike brown and pink shrimp, white shrimp are not grooved. Part of their shell is a well-developed, toothed rostrum that extends to or beyond the outer edge of the eyes. White shrimp can also be distinguished from other species by their much longer antenna (2.5 to 3 times longer than their body length), light gray body color, green coloration on the tail, and the yellow band on part of the abdomen. Nearly 90 percent of the white shrimp harvested in the U.S. comes from the Gulf, mainly from Louisiana and Texas. Prized for their sweet, tender meat and easy-to-peel shells, white shrimp are caught year-round, with peaks in the fall. Pink shrimp are crustaceans with 10 slender, relatively long walking legs and five pairs of swimming legs located on the front surface of the abdomen. They are grooved on the back surface of the shell and part of their shell is a well-developed, toothed rostrum that extends to or beyond the outer edge of the eyes. Pink shrimp typically have a dark colored spot on each side between their third and fourth abdominal segments. Their tail usually has a dark blue band (rather than the purplish band found on brown shrimp). 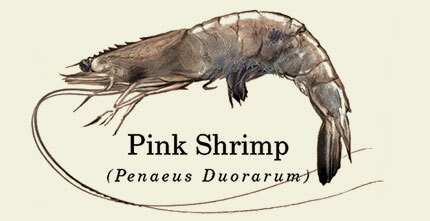 Nearly 85 percent of the pink shrimp harvested in the United States comes from the west coast of Florida. Prized for their sweet, tender meat, pink shrimp are caught fresh year-round, but are more abundant during winter months. 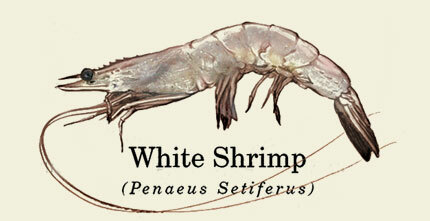 Rock shrimp look very different from the penaeid shrimp (white, pink, and brown shrimp in the same region). 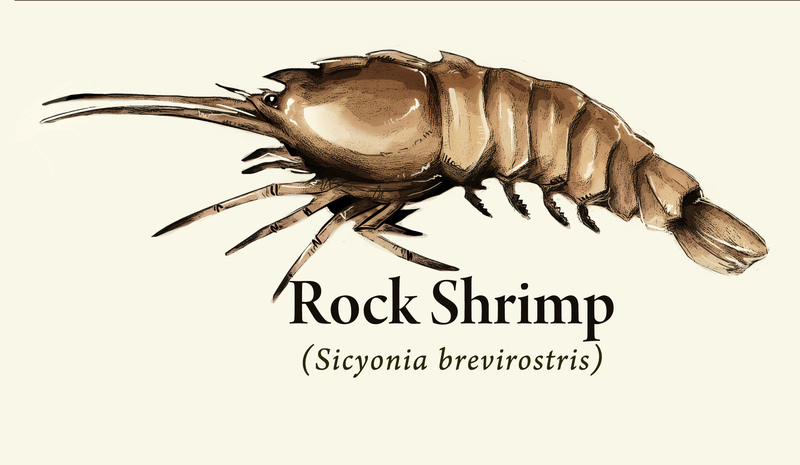 While rock shrimp are similar in general size and shape, they can be easily distinguished by their thick, rigid, stony shell. Their bodies are off-white to pinkish in color, with the dorsal (back) surface darker and blotched or barred with lighter shades. Their legs are red to reddish-purple and barred with white. The abdomen has deep transverse grooves and numerous nodules. Short hairs cover their body and appendages. Their eyes are large and deeply pigmented. Brown rock shrimp are the deep-water cousin of the common pink, white, and brown shrimp also found in the warm waters of the southeastern United States. It is the largest of six rock shrimp species found in this area. Rock shrimp are often called the “little shrimp with a big lobster taste.” They can easily be mistaken for a miniature lobster tail, and the texture of their meat also is similar to lobster. Most of the U.S. harvest comes from the east coast of Florida (mainly off the Cape Canaveral area). Source: U.S. wild-caught primarily in the cold, deep waters off the coast of St. Augustine and Pensacola down to the Dry Tortugas in the Florida Keys. 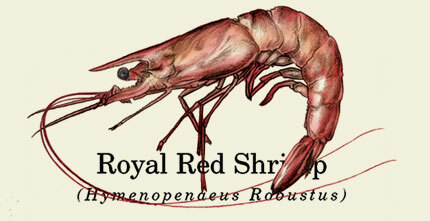 Royal Reds are perhaps the softest and most delicate of all U.S. native shrimp species. This vibrant red shrimp never sees the light of day, preferring the cold dark depths out at the edge where the gently sloping bottom of the Gulf drops abruptly off the continental shelf. Depths from 1,200 to over a half mile down are the home to this sweetest of all shrimp. Normally they are produced from early March through June and range from the Desoto Canyon off of Pensacola all the way along the shelf’s edge to the Dry Tortugas in the Florida Keys. The larger the number means the smaller the shrimp. See below for a list of ALL sizes available. The processing methods available for each size will be provided after size selection. Please be aware that not all processing methods are available for all sizes. Because shrimp are so small, they are sold by a count (number) per pound rather than by individual weight. This is expressed as a range. For example, a 16-20 count means shrimp of such a size that it would take from 16 to 20 of them to make up a pound. The smaller the count, the larger the shrimp. Counts are occasionally expressed in names rather than numbers, as seen here, such as “colossal,” “jumbos,” and “extra-large.” Since these appellations are not universally defined and regulated, the numbers system works best. 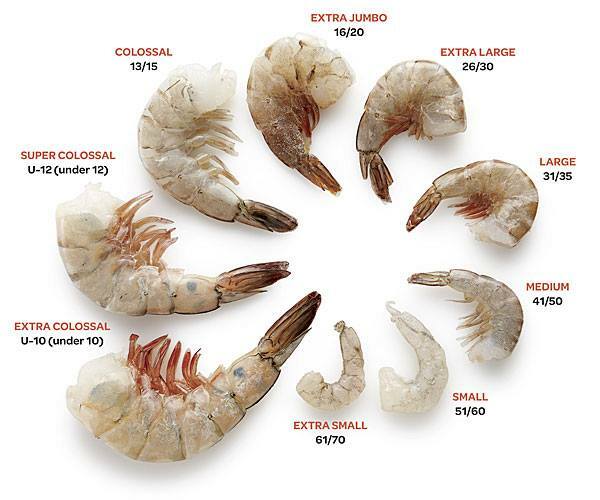 For example, a medium large shrimp may look like a jumbo if it’s next to a 61-70. As a rule, shrimp lose one size count when peeled, another when cooked. Another good rule is that 2 pounds of shrimp in their shells will yield about 1 1/4 pounds when peeled. Allow about 3/4 pound headless shrimp in the shell per person; if the shrimp are shelled, figure about 1/3 to 1/2 pound per person. "Retail Ready" are smaller options that are packaged for retail use. IQF (Individually Quick-Frozen) packs may be less convenient than blocks to store, but they offer savings in labor and allow the user to remove the quantity needed and return the unused portion to the freezer. IQF means the product was frozen in a matter of minutes or hours, not days. IQF shrimp are first frozen, then passed through a drip or spray of water to coat each piece, then re-frozen. This may be done several times to build up sufficient protection. Glaze is necessary to properly freeze shrimp. Both shrimp blocks and IQF shrimp are glazed with a protective ice coating to prevent dehydration. PUD and P&D shrimp are most often individually quick-frozen; however, all processing styles can be IQF. Random. (Also “jumble” or “shovel” pack): These may have some order, but shrimp are not evenly glazed. Layerpack. (Also “finger pack”): Meticulously hand-packed shrimp, frozen in a neat pattern and double-glazed. Blocks are packed in polyethylene wraps inside cartons, which are then filled with water inside the polyethylene film, so the block is completely encased in water before it is frozen. The industry standard size that block frozen shrimp is available in is ten, 5lb. blocks to make a 50 lb. case. Please be aware that block frozen shrimp may only be available in this amount. Please fill out the form below to obtain a price quote from our member processors. Select the type of shrimp and then select your specifications for that type. If you need an additional type (Brown, White, Pink, Rock, Royal Red), please click the "Additional type of shrimp needed." below. Select all that apply. You will be given options to specify number of pounds, frequency, processing and freezing type(s) after size selection(s). Note: If visual presentation is an important factor in the display of your shrimp, we highly recommend IQF shrimp over Block Frozen shrimp due to the higher quality that is retained with IQF. Copyright © 2014 American Shrimp Processors Association.